The following article appeared in Numismatic News on August 5, 2018. World War I war hero and Medal of Honor winner Sgt. 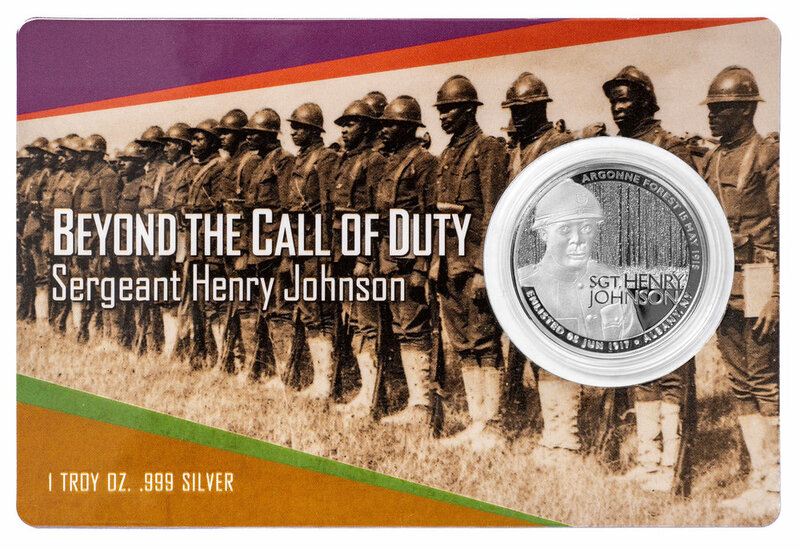 Henry Johnson has been honored by a new silver medal that debuted June 27 at the Palace Theatre in Albany, N.Y. The .999 fine silver medal issue is limited to 500, and it is priced at $29.95 each. Both sides of the medal were designed by Chris Costello of Arlington, Mass. He was the winner of a design competition sponsored by the issuing Ferris Coin Co. Send orders to the firm at 199 Wolf Road in Albany, N.Y., 12205, and see more online at www.FerrisCoin.com. “We’re thrilled to be working with an artist of Chris Costello’s talent,” said Mike Dozois, Ferris Coin Co. managing partner. On June 5, the City of Albany celebrated its second annual Henry Johnson Day. The date is when Johnson enlisted in 1917. Read the full story of his heroism at http://www.wmht.org/henryjohnson/.